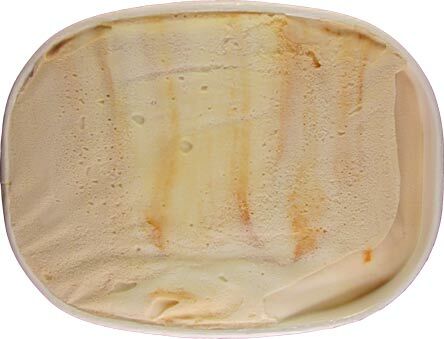 [By Nick, discontinued] ‎We get requests to review Creme Brulee ice cream pretty often for the site. The problem is with both Ben & Jerry's and Haagen-Dazs discontinuing their versions recently, there really aren't that many on the market. Enter Perry's and their light version of Creme Brulee that I found at the Niskayuna Co-op! The description of this one sounds really good especially for a light ice cream. You don't see custard flavored ice cream all too often and the caramelized sugar swirl sounds very tempting. Removing the protective seal, not a lot is going on. At least you're able to see all the components at play. They obviously come more apparent as you scoop further down. Now first off, I have to say I'm disappointed from the get go. You see, when I read caramelized sugar swirl, I'm expecting something along the line of the crunchy sugar topping you find on top of the traditional dessert or the mix-in I encountered in Ben & Jerry's version before it departed. What you're getting here is a traditional, buttery sweet caramel. 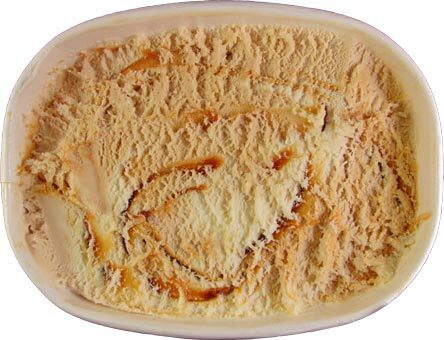 Now it's a fine caramel and all but calling it a caramelized sugar swirl is a bit misleading when that's not exactly what you're expecting. The ice cream's texture is better than I could have ask for. It's very creamy and smooth but doesn't melt as fast as their other light option on the market. As for the flavor of the bases, well I can definitely tell the custard one. It kind of reminds me more of a sweet cream with a heavier milkiness to it. I really enjoy it and wo‎uldn't mind something like it being used more often. 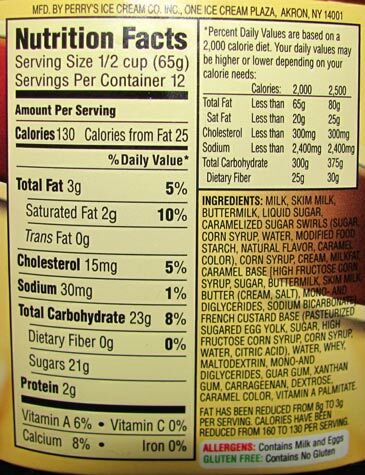 They were smart to label the caramel base as light because it is very light. To be honest, I would've thought it was a vanilla base if it wasn't for the description. Thankfully the caramel swirl makes up for the lack of flavor and it works more as a tempering agent to the swirls sweetness. All in all this is a good flavor especially for the calories. While there's no real connection going on between it and actual creme brulee from an overall flavor standpoint, I wouldn't say no if I was given a bowl of this. Just think of it as an ice cream version of Stonyfield's Creme Caramel if you need a more realistic comparison. After my first crack at a light flavor from Perry's, I look forward trying out their other options! Have you found any ice cream that comes close to replicating the Ben & Jerry's Créme Brûlée? I was excited when I saw this post in my dash on tumblr, but then saddened when it turned out that the caramelized swirl was not crunchy. Ben & Jerry's has really been bumming me out lately, first they got rid of Créme Brûlée, my favorite ice cream flavor ever. Then they go and changed the coffee heath bar crunch. (And I had a terrible experience with their pina colada flavor) as a Vermonter I am extra upset. 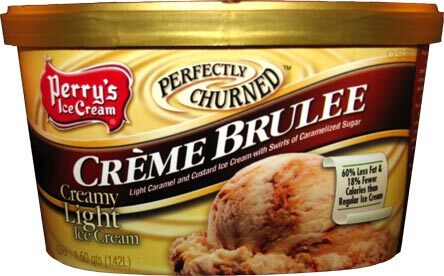 So if you ever find or have ever found a great Créme Brûlée ice cream with crunchy swirl be sure to post it please. Your reviews are great! brighton, I wasn't actually a fan of creme brulee from Ben & Jerry's though I was hoping to see a crunchy swirl here. As of yet, I haven't had anything that resembled Ben & Jerry's flavor but I'm always on the lockout to try new flavors. If there's any that you might think might be similar but don't wan to try yourself, you can always post it in our review request form on the page!